Hotlinking a.k.a. "stealing bandwidth", or linking directly to the location of a file stored on someone else's server, is generally frowned upon, and in many cases, actively opposed. Most file sharing sites like Rapidshare or Megaupload don't let you hotlink files that you store on their servers, making you jump through hoops like entering CAPTCHAs and queuing for downloads. 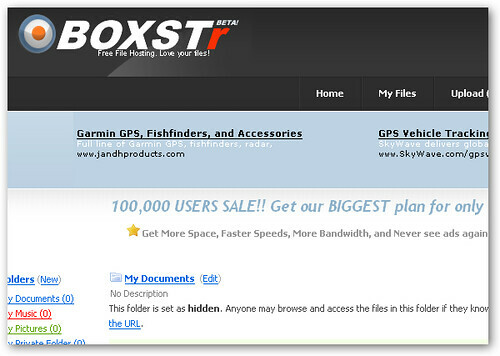 BOXSTr, however, is unique in letting you hotlink files to your heart's content. The only catch is that you only get 5GB of storage and 500MB of daily bandwidth with the free account. If you tend to share small files like MP3s, ebooks, or pictures, then BOXSTr might be a convenient solution, but more demanding users will probably want to try out MediaFire or DivShare even without the hotlinking feature. Related: Want to upload a file to multiple file storage sites? what is up with boxster everytime i try to get on this site it times out,anyone help?